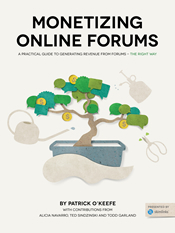 9 months of work culminates today with the release of my new ebook, “Monetizing Online Forums,” published by Skimlinks. You can download it for free right now. The goal of this project was to create a detailed guide to monetizing online forums the right way – in a manner that respects the community and balances out the need for a positive member experience with the need to generate revenue. We cover all meaningful methods and discuss how to implement them and get the most out of them. This includes display advertising, in-text monetization, classified and thread based advertising, sponsored brand placement, affiliate programs and CPA networks, product sales, premium memberships, mobile and monetizing your outposts. This isn’t your typical free ebook. It’s not a marketing teaser. No one is asking you for your email address. I am able to give it away for free care of Skimlinks and their sponsorship of the project. They wanted me to write an independent, helpful book because that is how they will get their value out of this project – by being associated with something that actually helps people. There is an interesting story behind this project (read it here). I also invited a few contributors to add their experience and knowledge to the work, including Alicia Navarro, CEO and co-founder of Skimlinks; Ted Sindzinski, co-founder of Giftery.me and ScubaBoard and former Digital & Social Media Strategist for Monster Cable; and Todd Garland, founder and CEO of BuySellAds.com. It’s not about pushing monetization. Not every forum needs to or should monetize. But, for many, it is necessary. It’s necessary because there is a bigger dream, because it is a full time job, because there are bills to pay or for some other good reason. We want to help people do it in the right way. If you download the book, I don’t want you to look at it as a free book, as in “that was good – for a free ebook.” I want you to judge it as something you paid for. When people get something for free, they often assign a lower value to it and they expect less of it – perhaps without realizing. When we don’t pay for something, we don’t have skin in the game. Don’t do that here. We didn’t treat it like “just a free ebook” when we wrote it. I treated it like a book for a major publisher. I want you to treat it the same. Even if you aren’t buying it, you are investing your time in reading it and that time has value. I hope it helps you. I hope it is worth your time. If it is, I would greatly appreciate you spreading the word. I’d also love to hear your thoughts and would love to have you review it – in any outlet that you wanted to. If you have any questions or there was something you wanted answered that wasn’t, please email me and I’ll help. I’ve started reading the paper and I think it deserves a comment (and maybe a review soon ;)). It contains a lot of interesting thoughts, best practices and highlights basically everything (imo) that a CM / admin should know about $$$ and forums. My favorite quote of the paper is a very general one. Looking forward to keep on reading! Thank you, Ben. I’m really glad that you enjoyed it and would love for you to review it, if you find the time.